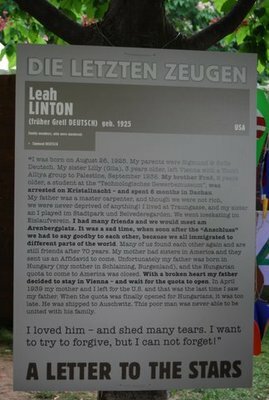 "I try to forgive, but I can not forget"
Margarete Leah Linton's panel was placed at the Heldenplatz in Vienna in May 2008. 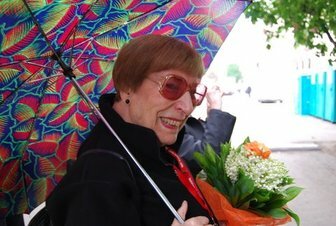 “I was born on August 26, 1925. My parents were Sigmund & Sofie Deutsch. My sister Lilly (Gila), 3 years older, left Vienna with a Youth Alliya group to Palestine, September 1938. My brother Fred, 5 years older, a student at the “Technologisches Gewerbemuseum”, was arrested on Kristallnacht – and spent 6 months in Dachau. My father was a master carpenter, and though we were not rich, we were never deprived of anything! I lived at Traungasse, and my sister an I played im Stadtpark und Belvederegarden. We went iceskating im Eislaufverein. I had many friends and we would meet am Arenbergplatz. It was a sad time, when soon after the “Anschluss” we had to say goodby to each other, because we all immigrated to different parts of the world. 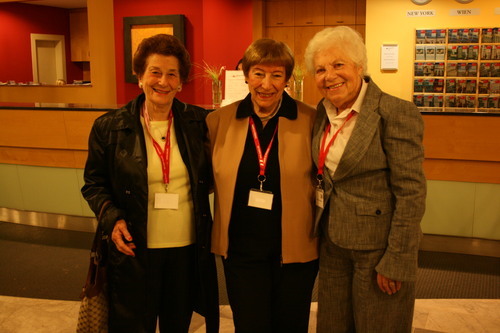 Many of us found each other again and are still friends after 70 years. My mother had sisters in America and they sent us an Affidavid to come. Unfortunately my father was born in Hungary (my mother in Schlaining, Burgenland), and the Hungarian quota to come to America was closed. With a broken heart my father decided to stay in Vienna – and wait for the quota to open. In April 1939 my mother and I left for the U.S. and that was the last time I saw my father. When the quota was finally opened for Hungarians, it was too late. He was shipped to Auschwitz. This poor man was never able to be united with his family.